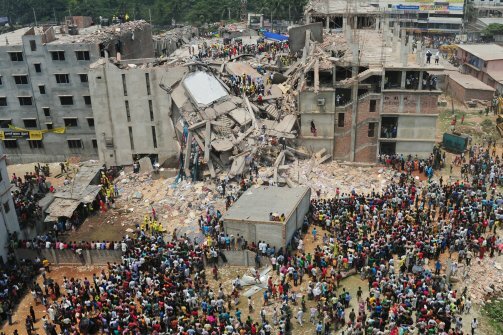 On April 24, 2013, an eight-story garment factory in Dhaka, Bangladesh collapsed, killing 1,127 workers and injuring more than 2,500. Labor and workers’ rights groups are protesting the most recent attempt by Wal-Mart, Gap and 15 other American retailers to skirt meaningful safety reforms in the Bangladeshi garment industry. The mega-retailers’ plan is nonbinding, not transparent and didn’t consult factory workers or labor groups. The IAM and many labor groups around the world agree that the only way to stop the tragedies is to enforce the agreement being implemented by more than 80 retailers and global unions, including IndustriALL. The five-year binding “Accord on Fire and Building Safety in Bangladesh” sets forth comprehensive inspections, repairs of factories, and training and involvement of workers. Click here to sign a petition demanding Wal-Mart, Gap and other retailers abandon their ineffective PR-driven safety plan and sign on to make meaningful change in Bangladeshi garment factories.